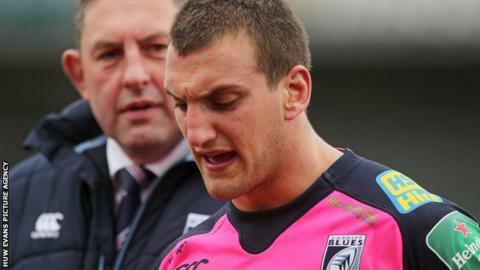 Cardiff Blues director of rugby Phil Davies says the region is doing everything it can to keep hold of Wales captain Sam Warburton. The flanker is out of contract this summer and has given the region and Welsh Rugby Union until Wednesday 11 December to sort out a new deal. "Sam says he wants to stay which is fantastic," Davies said. "We are trying all we can possibly do for that to happen." Davies added: "Richard Holland, our chief executive, and Peter Thomas, the chairman, I know they're working hard. "It's about managing the resources you have to try to get our team more competitive and keep iconic players like Sam, Leigh (Halfpenny). "It's a big time and the people involved are trying to do the best they can." Wales coach Warren Gatland has warned Welsh rugby can "ill afford" to lose a player of national skipper Warburton's stature. But he said that economic reality dictated that the 25-year-old player could leave. Wales' four regions - the Blues, Ospreys, Scarlets and Dragons - have been operating under a £3.5m salary cap since July 2012. Representatives from the regions will meet with the Welsh Rugby Union on Wednesday. Reports have linked the quartet with a bid to join England's Aviva Premiership as rows over the future of European competitions continue. Last week, the English clubs confirmed they would not be involved in the Heineken Cup next year. The RFU, rugby's governing body in England, still hopes a solution can be struck to ensure a pan-European competition next season. The financial uncertainly has led to British and Irish Lions captain Warburton joining a host of players considering their playing futures beyond the end of the 2013-14 campaign. If he leaves, Warburton would join a host of Welsh stars in exile at leading French and English clubs. Wing George North joined Northampton before the start of this season, while Lions lock Ian Evans has signed for French club Toulon. And Clermont Auvergne have recruited Scarlets, Wales and Lions centre Jonathan Davies from 2014-15. Luke Charteris, Dan Lydiate, Jamie Roberts, Mike Phillips and James Hook play for clubs in France while George North, Paul James and Craig Mitchell are in England.